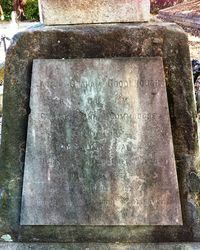 The grave commemorates James Graham Goodenough CB CMG (3 December 1830 – 20 August 1875). James Graham Goodenough CB CMG (3 December 1830 – 20 August 1875) was an officer in the Royal Navy who went to become Commander-in-Chief, Australia Station from 1873 and died aboard HMS Pearl off the coast of Australia from wounds inflicted from poisoned arrows in an attack by natives of the Santa Cruz Islands. 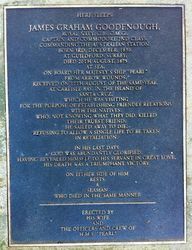 A memorial site to him exists at the Carlisle Bay Primary School, on Santa Cruz Island in the Solomon Islands. St Thomas' Cemetery, where the body is interred, is not attached to the church grounds, but is about a mile away in West-street . Here, towards the rear of the burial ground, is the allotment, surrounded by a chain supported on crossed anchors on a stone coping. 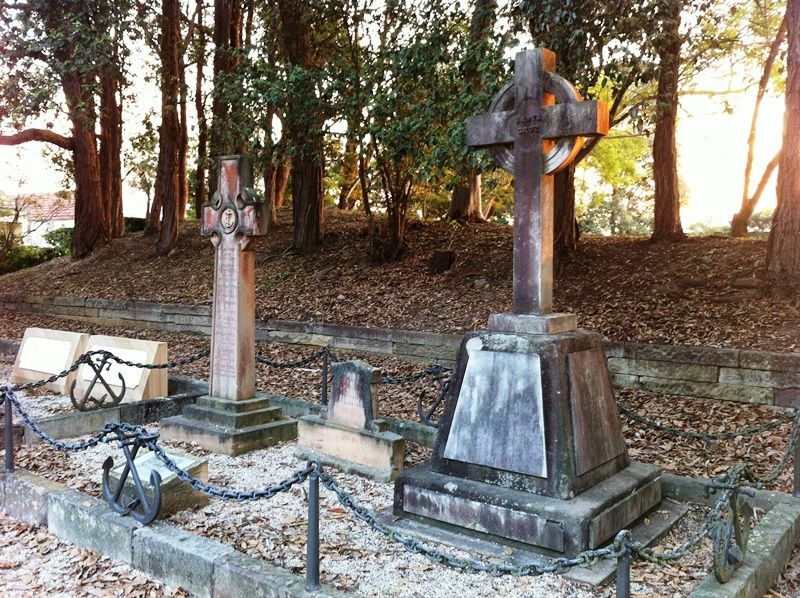 This grave is kept neat and clean, and is a marked contrast to many others there. 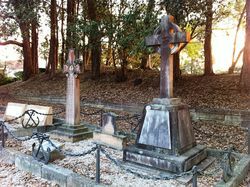 It contains three graves, the centre, Commodore Goodenough`s, and the sides two gallant young seamen. These graves and the simple inscription on the sides of the monument, bear eloquent testimony to his thought and consideration for others' feelings. They had been wounded at the same time, and when he knew that they, like himself, were dying, he insisted that they should be buried, one on either side. Their names were Frederick Small, l8, Edmund Raynor, l8. The memorial or monument is a simple encircled cross of marble, standing on a freestone base. The words "Santa Cruz" are on the bar within the circle. Around the foot of the cross has been inscribed the Commodore's favourite text during his illness, "God is love, with whom there is no variableness, neither shadow of turning. " At the base of the pedestal we have these rather remarkable words "In his last days God was abundantly glorified, having revealed Himself to His servant in great love, his death was a triumphant victory. " A marble slab beneath the cross gives in brief the circumstances leading up to his death. "Born at Guildford, Surrey, died 20th August, 1876, at sea, on board her Majesty's ship Pearl, from arrow wounds received on 12th August of the same year, at Carlisle Bay, In the Island of Santa Cruz, which he was visiting for the purpose of establishing friendly relations with the natives, who, not knowing what they did, killed their truest friend. He sailed away to die, refusing to allow a single life to be taken in retaliation. " On the rear we have "Erected by his wife, and the officers and crew of H M S Pearl " And, added later "Victoria H Goodenough, Fell asleep 29th Jan, 1917." Excerpt from The Sydney Morning Herald (NSW), 30 April 1932. "Born at Guildford, Surrey ; died 20th August 1875, at sea, on board her Majesty's ship Pearl, from arrow wounds received on 12th August of the same year, at Carlisle Bay, in the Island of Santa Cruz, which he was visiting for the purpose of establishing friendly relations with the natives, who, not knowing what they did, killed their truest friend. He sailed away to die, refusing to allow a single life to be taken in retaliation. " In his last days God was abundantly glorified, having revealed Himself to his servant in great love, his death was a triumphant victory. On either side of him rests a seaman who died in the same manner.